Tired of the 9 to 5? Looking to find a solution that will replace or extend your income? This inspiring and passionate guy, Yaro Starak, is positively legendary in the field of Internet Businesses. He lives the ‘laptop lifestyle’ and has helped thousands of people to also leverage the power of the online world. The best part about Yaro, apart from his super personable style, is that his website, entrepreneurs-journey.com, gives all of the information away for free! I think he’s got a brilliant writing style. Everything he says is mapped out clearly and it’s easy to follow. 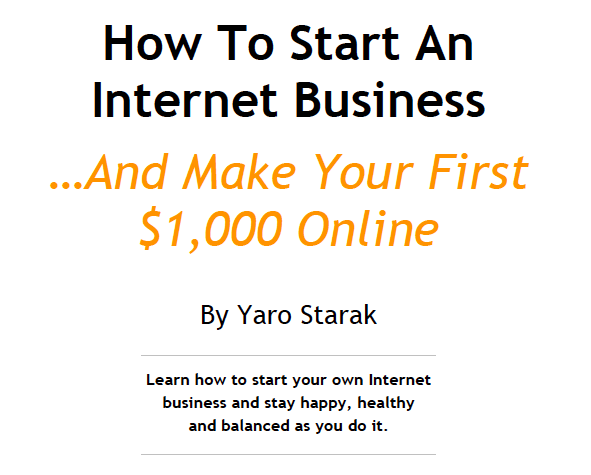 So, if you’re considering trying to start an Internet business, you may find his free e-Book, ‘How to Start an Internet Business and Make Your First $1000 Online‘, helpful. It certainly couldn’t hurt! Please note that I don’t make any money by telling you about this, nor has he asked me to tell you. I enjoyed reading it and wanted to pass it along. On page 51 of his PDF he gives permission to pass it around so feel free to share with friends or family who might benefit. If you know of another beneficial free PDF or e-Book that the author is also happy for us to share, please let me know.